On May 12, 2018 at approximately 8:50 pm, Officers from the Winters Police Department attempted to conduct a vehicle stop on a 2002 white Chrysler for traffic violations. The driver, later identified as 36-year-old Winters resident Servando Ybarra, continued eastbound on Russell Boulevard and turned into the Villas at El Rio Housing complex at a slow speed while shouting at the Officers. Ybarra then exited the Housing Complex and took the on ramp to northbound Interstate 505, later exiting on County Road 29A. Winters officers requested assistance from the Yolo County Sheriff Office and the California Highway Patrol. Traveling between 55 and 83 miles per hour on County Road 89, Ybarra returned to the City of Winters, looped through an apartment complex, a business parking lot, and ran several red lights in an apparent attempt to evade Officers. Ybarra headed eastbound on Grant Avenue and exited the city limits via Russell Boulevard where a Yolo County Sheriff Office deputy was able to deploy a spike strip in front of the vehicle, puncturing two of the vehicles’ tires. Ybarra then turned onto County Road 92F and into a walnut orchard. A California Highway Patrol air unit was able to direct law enforcement to the area and Ybarra was taken into custody. 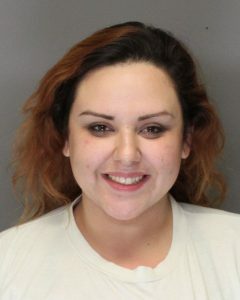 Ybarra was arrested and booked at Yolo County Jail for felony evading a police officer as well as reckless driving, failure to stop at a stop sign, failure to stop at a red light, driving on the wrong side of the roadway, failure to yield to oncoming traffic, and driving on an undivided highway at a speed greater than 55 miles per hour. Ybarra was also found to be on probation and booked for violating probation and removing an ankle monitor. court order and contributing to the delinquency of a minor. sexual acts with the minor and providing the minor with narcotics. conducting interviews with the victim at the MDIC. aware of their children’s internet and social media activities. On April 5, 2018, Nicholas Kershner was sentenced in Yolo County Superior Court for felony Driving Under the Influence. Kershner was the driver of a Ford F150 involved in a solo vehicle major injury collision on Railroad Ave. south of Grant Ave. on April 29, 2017. Witnesses reported Kershner was driving southbound on Railroad Ave. at speeds exceeding 70 MPH, ran a red light at the intersection of Grant Ave., and sideswiped a light standard, which sheared off the passenger side of the F150. The passenger in the vehicle, Brooke McNeil, suffered major injuries requiring a lengthy stay in hospital and subsequent recovery and rehabilitation. Kershner was arrested on the scene for felony DUI and a blood test taken nearly 3 hours after the collision showed his blood alcohol content (BAC) was .18, still over double the legal limit. According to Yolo County Deputy District Attorney Frits Van der Hoek, Kershner pled guilty to felony DUI with enhancements for having a BAC over .15, reckless driving, and inflicting great bodily injury. Kershner was sentenced to a suspended sentence of 7 years 4 months in state prison and placed on 5 years’ probation. As terms of his probation, Kershner will serve 180 days in Yolo County Jail and compensate the City of Winters $4,954.92 to recover costs associated to the City’s Police and Fire Department’s emergency response to the incident. Officers from the Winters Police Department would like to invite the community members of Winters to join in the Pink Patch Project. The program started with southern California public safety agencies as a collaborative public awareness campaign designed to bring attention to the fight against breast cancer. The development of new techniques in surgery, radiation therapy, hormone therapy and chemotherapy in addition of increasing awareness about the life-saving benefits of early detection has helped increase the number of breast cancer survivors. However, it is estimated that approximately 1 in 8 women will be diagnosed with breast cancer in her lifetime. This disease can have a profound impact on the patient and their loved ones. The program centers on pink versions of the Public Safety Officer’s uniform patch. The project goal is to raise funds from the sale of pink patches to go directly to fund the research, treatment and education needed to help find a cure and to support breast cancer research organizations in combating this devastating disease. The pink patches are intended to stimulate conversation with the community and to encourage public awareness about the importance of early detection and the on-going fight against this disease. Each public safety agency collaborating in the Pink Patch Project campaign has partnered with a cancer research organization or support group in their communities. 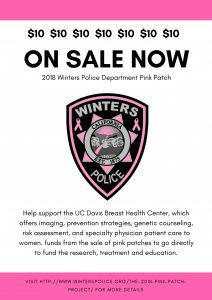 Winters PD has chosen to support the UC Davis Breast Health Center, which offers imaging, prevention strategies, genetic counseling, risk assessment, and specialty physician patient care to women. You can support the Pink Patch Project by contacting Sergeant Ramirez at the Winters Police Department to purchase your Winters Police Pink Patch for $10 cash or check. The proceeds from sale of the patches will go directly to benefit UC Davis Breast Cancer Research. 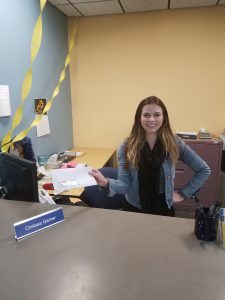 Chelsea Garner of the UC Davis Breast Health Center holds a check for $1020 donated during the 2017 Pink Patch Project last year. As previously reported, the City of Winters continues to experience a series of thefts from unlocked vehicles and some auto burglaries. Although a small portion of these crimes involved forced entry into the vehicles, the vast majority of thefts (70%) occurred from unlocked vehicles or vehicles with their windows cracked for ventilation. The thefts have occurred throughout the city regardless if the vehicle was parked in a driveway or on the street. Some of the items taken are small electronics (lap tops, tablets, Ipods, GPS), purses, wallets, assorted cash, and small personal items (chargers and sunglasses). All appeared to be crimes of opportunity involving items left in plain sight. While several residents have provided screenshots from home security camera and several arrests have been made, the number of thefts from unlocked vehicles has continued un-abated. Since September of 2017, Winters Officers have taken 64 reports and believe many more incidents have gone un-reported. 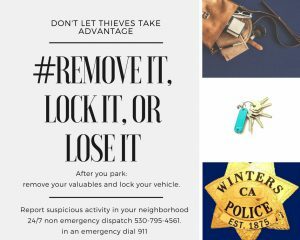 The Winters Police Department reminds residents that leaving vehicle unlocked and items visible in your vehicle provides an opportunity for thieves to enter your vehicle and take your possessions with little effort. Any information regarding suspicious persons in your neighborhood can be reported anonymously by calling 530-795-4561. • Report any suspicious activity to Winters Police at 530-795-4561 for non-emergency. Call 911 in the event of an emergency. Always remembering to “REMOVE IT, LOCK IT, OR LOSE IT” reduces your chance of being the next victim. The Winters Police Department will partner with the California Highway Patrol- Woodland Office, Winters Combined Parent Teacher Association, Shirley Rominger Intermediate School, the City of Winters, the After School Program and many individual volunteers to help put on Bicycle Rodeos for the students of Shirley Rominger Intermediate School. Bicycle Rodeos are interactive courses which teach basic bicycle safety skills. Participants rotate through educational stations, and then apply their newfound knowledge on active skills courses. Bike Rodeos provide children with the skills they need to ride independently in our community as part of a healthy life style. This year Shirley Rominger Intermediate School will be holding their Bicycle Rodeo on March 15th. The rodeo is open to all SRIS students, who may use bicycles, scooters, skateboards, or roller skates to participate. A limited number of loaner bicycles are available for students who need them. The bicycle rodeo utilizes bicycle safety equipment (safety cones, bicycles, bicycle helmets, and other equipment) purchased through donations in order to make sure every child can participate in these activities. Any equipment left over is used during future Bicycle Rodeos. If you would like to support bicycle rodeo program and wish to donate, checks can be made payable to the “WPD Youth Services Program.” The program’s Federal Tax ID number is 94-6000457. A receipt can be provided for tax purposes if requested. All money donated will go towards the program. Thanks to alert Winters residents, two separate incidents over the weekend resulted in the arrests of a total of three people for felony charges. On Friday, January 26 at approximately 10:53 AM, a resident saw a male and female in and around a black 1996 Honda Accord parked in the 600 block of Foxglove Cir. The resident called the Winters Police Department after the subjects walked away and left the vehicle behind but provided a detailed description of both. Responding officers found that the Honda had been reported stolen from Woodland earlier in the day and an area check failed to locate the subjects. At approximately 3:35 PM, Winters officers saw a male and female matching the description given earlier walking on Railroad Ave. near Grant Ave. Officers detained the subjects and the witness from earlier positively identified both subjects. Officers arrested Tony Deweese, Jr., 37-years-old, and Lizbeth Sandoval, 25-years-old, both residents of Woodland. Property belonging to the Honda’s owner was found in Deweese’s possession and property recovered from the Honda was identified as belonging to Deweese and Sandoval. Deweese and Sandoval were booked at Yolo County Jail for stealing the vehicle and being in possession of stolen property. On Sunday, January 28 at approximately 9:29 PM, a resident reported to the Winters Police Department that a subject had entered their vehicle parked in the 20 block of E. Edwards St. The subject ran as soon as he saw the resident but the resident provided a detailed description of the subject. The resident advised their vehicle had been locked and officers determined the vehicle had been forcibly entered by “jimmying” the lock. The resident also found that $60 in cash had been taken from their belongings inside the vehicle. 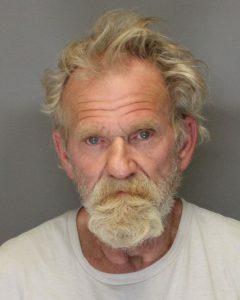 Officers conducted follow-up and determined a possible suspect was Richard “Rick” Cooper, a 60-year-old transient living in his vehicle in Winters. The officers contacted Cooper, who was found to match the description of the subject and the resident subsequently positively identified Cooper. 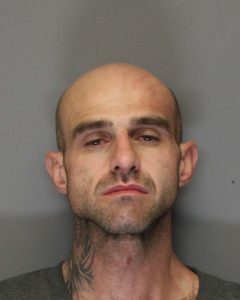 Unfortunately, the property was not recovered, but Cooper was arrested and booked in Yolo County Jail for vehicle burglary. Making Winters a safe community is truly a partnership between the Winters Police Department and our residents. The successful outcome of both these incidents illustrates how critical it is for our residents to be alert, promptly report suspicious activity to their Police Department, and be willing to be involved in the investigation. The Winters Police Department Dispatch Center can be reached 24/7 at 530-795-4561 or by dialing “9-1-1” in an emergency. It’s every grandparent’s worst nightmare, a phone call with a panicky grandchild on the other end. “I’ve been arrested” they say “please don’t tell mom.” For one Winters resident this nightmare became reality. After being told of an arrest out of state, a grandmother was asked to provide $3,000.00 in Target gift cards to a lawyer over the phone. The money was supposed to go towards bond, instead the team of individuals working a “Hey Grandma” scam was able to take the money and run. It was only after calling to check on her family, the grandmother realized she had been scammed. The “Hey Grandma” scam starts with a phone call. Scammers choose phone numbers at random, using telemarketing equipment and computer software to call hundreds of people a minute. Once they have a good phone number, they go to work and use the internet to associate the number to cities, addresses and names. Scammers then use the information throughout the call to make the person believe they know the area and the person’s family. The scam caller often disguises their voice and waits for the person they called to use a name. The caller then confirms it’s them and tells of an emergency (they were arrested or robbed) then passes the person to a lawyer or a friend who will explain everything. Even if the person picks up red flags (voices that don’t sound right, situations that seem to be off, or unusual methods of payment) the caller will explain them away then hustle the person onto the next step. If the person hesitates and mentions wanting to check with family members or law enforcement, the scammer will tell them there is no time or that they are embarrassed and want to break the situation to family members themselves. Scam callers will then demand payment, sometimes staying on the phone with people to encourage or berate them to hurry. Often the scammers will demand payment using gift cards because gift cards don’t carry the same protections credit or debit cards do. Once a person has given the gift card number and access code to the scammer, the funds are instantly removed from the card, often with no recourse. Victims of scams are often angry and embarrassed they were fooled and consequently may decide not to report the incident to law enforcement. For the grandmother who experienced this scam first hand, it was more important to her to share her story in the hopes it might help others avoid becoming victims of the same scam. On September 5, 2017, suspects broke the front door of the Berryessa Sporting Goods located at 115 E. Grant Ave. and stole approximately $600.00 in tobacco and alcohol products. Although leads in the case were quickly developed, it took two months of diligent investigative work by Winters Police Department Cpl. Gordon Brown to positively identify one of the suspects. On January 20, 2018, Cpl. Brown arrested a 16-year-old Winters resident for partaking in the burglary. The juvenile was subsequently booked at Yolo County Juvenile Hall for burglary, conspiracy, and possession of stolen property. More arrests in the case are pending. Cpl. Brown had been serving for the last three years in the School Resource Officer positon (SRO), but had been asked to focus on conducting more thorough follow-up and investigations that our Patrol Officers were unable to do, such as this burglary. Cpl. Brown rotated back to Patrol January 1, 2018, but based on the success of his efforts, and recognizing the pressing needs of our growing community, the SRO positon was reorganized into a full-time Detective position with ancillary SRO duties, the first for the Winters Police Department, and Ofc. David Gonzalez selected for the three year assignment. Through the efforts of dedicated officers, such as Cpl. Brown and Det. Gonzalez, the Winters Police Department is committed to ensuring the safety and security of our residents. However, we cannot be successful without the assistance and support of our community. If you see suspicious activity, we encourage you to contact the Winters Police Department Dispatch at (530) 795-4561 or dial “911” if an emergency. You can also contact the Winters Police Department with anonymous tips at (530) 795-2261 or tips.winters@winterspolice.org. As previously reported, the City of Winters has been experiencing a rash of thefts from unlocked vehicles and some auto burglaries. Although a small portion of these crimes involved forced entry into the vehicles, the vast majority of thefts occurred from unlocked vehicles. The thefts have occurred throughout town and a variety of items were taken from the vehicles. All appeared to be crimes of opportunity. A resident provided a screenshot from their home security camera, which captured the image of a suspect who had just committed a theft from his neighbor’s unlocked vehicle on January 3, 2018 at 10:22PM. The location is being withheld to protect the source of the screenshot. The Winters Police Department is asking the community’s assistance in identifying this suspect. Any information can be sent anonymously to tips.winters@winterspolice.org or by calling 530-795-2261. Until these offenders are caught, the Winters Police Department reminds residents that leaving vehicle unlocked and items visible in your vehicle provides an opportunity for thieves to enter your vehicle and take your possessions with little effort.